Well I do not really know what to talk about in terms of this system or really what to expect. I think it is a very tricky period coming up but the same pattern of the past few years of cut off lows travelling through E SA and NW VIC seems to continue. I expect little in Melbourne but quite a good chance in the north and west. I'm more worried it will go the other way Karl as GFS pushes everything way to south towards Tasmania early next week and left with a high over Southern NSW and a weakening westerly wind over us by Wed/Thursday next week. EC still seems to be holding at least in the tracking deparatment moving over us before heading SE. Well, one thing we can say is that the situation, for the next week at least, is volatile. 06z GFS now gives us widespread rain over much of the state in the order of 25mm+ in most western and central areas and then an ECL relatively close to the state as the low moves over us and into the Tasman. What this tells us is that the situation could still improve for us as we get closer to the series of events (or get worse of course). It no longer looks like a cut off fizzing out to our west anyway. I think we can be confident of some modest totals about the central ranges over the weekend maybe 5-10mm with the initial moist northerlies just ahead of the low as we are talking only a couple of days out now. Just as long as we get some rain on the ground. I must admit that US don't look too bad at this time. I haven't seen EC but hoping that is improving for us aswell. Could be a few showers on the weekend. Progs are all over the place with this system ATM. The main issue is where it cuts off - EC tends to be further north and west while US/GASP/UK is rather closer to Vic. It does look like a prolonged period of shower/rainy weather commencing on Sat/Sun, but where and how much is really difficult to pick. Also looks pretty mild - read rainy in the alps - at least initially. Hopefully we get a clearer picture of the sequence by tomorrow. We certainly need a big event. Check out the elongated trough along the 40th parallel progged by EC at the end of its current run. Would be interesting if it comes off. I'll be watching to see how much that prognosis changes till then. Models are on knife edge, and output is thus variable. Latest Nogaps run has an interesting outcome this tuesday, with a massive event that appears to be an 'inland east coast low' if that is possible. GFS is increasing totals every run. Atleast its not a boring pattern, lets hope we get the dice in our favour for once. Yeah it looks touch and go. It is largely looking better than yesterday. Could be one of those events where the totals clock up over the course of a week. Well I think we have got more twists and turns to come with this system. Looks like there is going to be some major weather system in our regions, whether it be to our north or west over the coming 10 days but I cannot see it affecting all of VIC unfortunately. Looks to be a period of scattered showers and patchy rainfall but still the picture keeps revealing rainfall north and west of our border. NSW could be in for another hiding, especially the inland areas. Not sure I'm game to predict beyond the weekend as its very messy but certainly the weekend looks to be pretty straight forward. A weakening front approaches the western border of Vic on Saturday and while this weakens the associated upper trough moves across the SE. As a result this will likely set up some upslide across most of central/eastern Vic in mild rather humid NE to N flow with the north-central and northeast looking like the focal point - US, UK and EC all show falls locally up to 10mm with this system and the potential for more about the ranges and in NSW. Also a very mild weekend - snow levels are really high with this system so won't be a pretty sight on the snow fields IMHO. Next week looks messy, but at this stage EC, GASP and UK all cut the low off near Mt Gambier and put Vic is an unstable NE flow. Should be pretty showery, though such a sequence will likely favour the west and northwest. 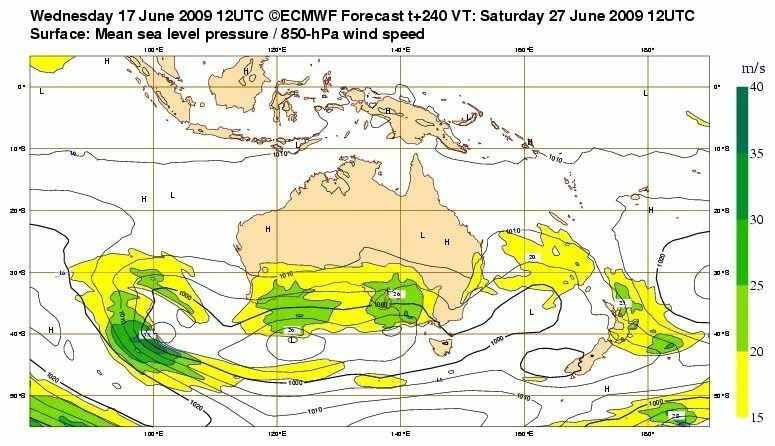 EC has gone mad late in the sequence with a BIG event for eastern OZ. Haha yeah I saw what EC was hinting tonight... I think it's on loopy pills Though it definitley hints at big systems around in the outlook period. Weekend looking unstable, patchy rain, mainly west and north/ranges. Up to 5-10mm. I am not going to mention after then yet, as been mentioned above... just way to volitile to talk about, so many changes could happen. Can someone get me what EC is on tonight? Yeah thats abit extreme and alot different to this mornings run for 10 days time. In the short to medium term looks like DJ is right falls to 10mm can be expected on the Northern slopes of North Central and NE Vic on weekend think there be very little in the SW the front seems to weaken before it even gets there but the upslide/Upper trough develops up as it Moves through Central and NE Victoria. As for early/Mid next week NOGAPS is the best of the models in my mind with a cut off right over Victoria and slow moving too don't like how EC and GFS push it away to the south to quick as both models leave us in NNW winds by Wednesday/Thursday you know what that means for us down here very little or nothing interms of rainfall. Number one, has anyone ever seen the models so volatile in their progs over the entire period? Not for a long time I would suggest. Number two, whilst highly unlikely to occur as EC is saying atm, that system at the end of the run is not as crazy as it looks. At this time of year we should be getting big systems like that and if you looked back in time over the synoptic charts archive I reckon you would find quite a few events like that one occurring over the state in winter. The weather has got so bland, dry and high pressure dominated in recent years that when a low like that pops up in the progs it looks ridiculous because we don't expect them anymore or remember them occurring. Anyway a massive system like that coming down from the inland with highly convergent SE airflow over the state would absolutely smash my area. Would be looking at 100mm+ probably. Also with that scenario it would be quite mild and extremely muggy for this time of year with an almost tropical feel to the airmass, heaps of fog and mist with the rain. NoRelationToNed wrote: Check out the elongated trough along the 40th parallel progged by EC at the end of its current run. Would be interesting if it comes off. I'll be watching to see how much that prognosis changes till then. Haha, now that is ridiculous. Never seen anything like it. That was a case of EC going off the scale. I have seen this happen a few times ahead of a large and major weather event over the region specified. Whether that be NSW/VIC or NSW/QLD. I think VIC is a toss of the coin away from something decent. Good setup rains this weekend along the divide as pointed out by many already looks likely. It'll be good if GFS's scenario for the mid part of next week holds! Areas of -4 LI's on Wednesday through parts of Victoria and decent CAPE! A long way out but this storm deprivation is killing me! Not much to add about this system. Still looks best for the NE and west (and SA). Should see the first rain develop tomorrow (though patchy). Is a very complex sequence for the next week with slow moving systems so rainfall is going to be very uneven. Well, the solid showers are still coming through and increasing in duration to areas of rain. A chance we might actually do alright out of this if it keeps up. so far only very light showers here, hardley even enough to wet the ground. I noticed WZ have already downgraded their forcast for the up coming week, lets hope they have it wrong. I dont like it when cloud hangs around for too long without raining, seems to suggest the trigger for rain is too weak. 2.4mm today. Stopped raining a while ago and is now just damp with plenty of low cloud. Tomorrow looking better according to GFS and LAPS etc. with more unstable atmosphere, total-totals hitting 50 in parts of the state mainly the east. BOM have put thunderstorms into the forecast for Tuesday! We have a really interesting setup for Tuesday to Thursday next week with a strong upper low slowly barreling its way over the state, this combined with high moisture levels right through the atmosphere coming down from QLD (DPs into double figures in parts) looks at this stage like producing a rare mid winter thundery outbreak. Focus at this point in time is in the north and NE and probably extending along the ranges as well in central and eastern parts.Southern VIC however is also in line for a few thundery showers and it could all tend to solid rain areas, the potential is there during this period for some good falls in many parts. Btw, I would think in the current setup progged by the models that storms are likely overnight as well as during the day. Odd day down here with As/Ac threatening to rain all day and a few lights showers this evening (at Sandy Point). Has been calm all day with the roads staying wet all day from the overnight fog. As anticipated some light/moderate falls pilling up on the north of the divide - and just sneaking into parts of central Vic and south Gippsland - feel sorry for those people who went to Buller today with 12mm of rain and still raining. Is going to be a horrible few days in the alps with plenty of rain/drizzle. Very messy set up the next 5 days with NE-NW flow an a series of shortwave features. In the next 24 hours continues to look best around the northeast, but we could see some decent showers also develop through north-central -> central Vic as the first upper trough approaches. In my experience the EC and US model tend to be the most reliable in these situations as a lot of the rain is falling out of low level cloud (which these model tend to do well). (BTW very odd to see showers moving north to south - these set up usually give some good totals as the indicate good upslide).